I don’t know where I first saw this but I know that I definitely fit the criteria. It’s often found in those who engage in Tangential Genealogy. Because she has given me permission to use her images I am adding this definition from Twisted Twigs and Gnarled Branches. For this word I am reposting a blog post of mine from the GeniAus Blog in 2012. 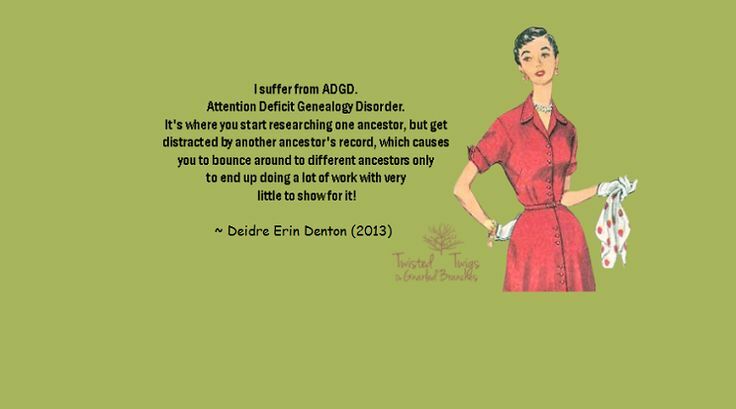 In a post on Google+ recently Kathy Reed and Susan Clark were talking about the temptation to go off on tangents when doing genealogy research. It’s true confessions time – I am a tangential genealogist. When I told her recently that I was going to spend a few hours at our State Library one of my very interested non/genealogy friends (a rare bird) asked how I go about my research. This caused me to reflect on my practice. Now, when I am planning a trip to a distant city or repository I am the model of organisation. I refer to my research planning spreadsheet (yes I have one), work out some goals for my trip, check catalogues and, where possible, pre-order resources. When I just have a few spare hours I practice Tangential Genealogy, so my answer to my friend was “I don’t know, I haven’t a plan.” I told her that I may start to look at a database that I can’t access from home and probably get sidetracked when I come across someone or something interesting. I may decide to look at a particular surname in my database and methodically go through the people one by one checking on facts (!) I added years ago and adding sources where applicable. My last effort with this took me as far as someone with a given name starting with C, I found something juicy so the poor D-Zs were ditched as I set off on a chase. I may just browse the shelves in the library until I come across an unfamiliar resource (as I did last week) and thumb through its pages to see if I could find something relevant to my research (and I found a few gems). I may see a name in my database and, like I did this morning, put it into Google to see what I could find. This morning I found a treasure written in November, 2011 for someone I hadn’t researched for a few years. While I am very serious about my family history research the bottom line is that is is my hobby. I like to have fun so, when I tire of a task or get a whiff of a scandal I may go off on a tangent. I make no apology for being a Tangential Genealogist.